Lo, behold and get ready to see your favourite mainstream actresses of 90’s coming back to grace the silver screen all over again. Times have clearly changed and the career of a leading actress has now got a much deserved extension due to changing norms of film industry. Yesteryear actresses were not this privileged and most of them faded into oblivion or took the mother/ sister roles like Rati Agnihotri and Poonam Dhillon. Indian film industry has been a male dominated industry and leading actors have a larger shelf life than those of leading actresses. There is usually a huge age gap between the lead actors and newly launched debutant actresses. However, the reverse trend is mostly rejected (Rani-Shahid in Dil Bole Hadippa). Thanks to television reality shows we still get to see our favourite actresses, but we hardly get to see them in a mainstream movie. Amitabh Bachchan has been a glaring example of one personality who has defeated the established norms of the industry. At this age also he gets to feature in character roles specifically written for him (Paa, Bbuddah Hoga Tera Baap, Baghban). The revolutionizing ‘character role’ has revived the way our films are now written and this very fact combined with the challenging directors has opened a path for actresses to make an exciting comeback. What needs to be really underlined in this positive trend is the fact that most of these actresses – Madhuri Dixit, Sridevi, Raveena Tandon, Karisma Kapur have all been widely appreciated award winning actresses of their times. Actresses of current times are mostly former models and they leave a void for a film requiring a challenging and path breaking performance. There is a niche area for performance oriented roles that has made the comeback possible. 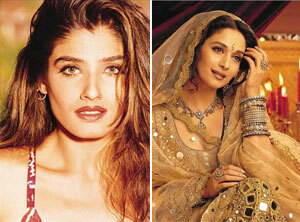 Raveena Tandon, 37 was earlier seen as a reality TV. Her last release was Bbuddah Hoga Tera Baap (2011) where she even had a special song to her credit. She has been happily married and after having two children she feels she is now in a space where she can take up more work. The former leading actresses are looking ravishing and have well-toned bodies. Sridevi at 48 is now currently shooting for her upcoming comedy English Vinglish. Though she is quite nervous to face the camera after her last release Judaai (1997) she definitely is excited and looking mega bucks! Karisma Kapur, 37 will be seen in a special appearance in Houesfull sequel and audience certainly cannot wait to see her dance moves yet again. She wowed us with her charm and dance skills in Dil To Paagal Hai (1997) for which she won National Award. She will be seen in a 3D horror film tentatively titled Dangerous Ishq. Karisma is firmly confident that age is no longer a barrier for an actress. Kajol, 37 has also maintained a work-life balance and has taken time off to focus on her marriage and children. She has continued to portray performance oriented roles and her fans are always ready to see her onscreen. Aishwarya Rai, 37 at the same age has been a great example for leading actresses. She has been the highest paid actress of her time and has continued to get meatier projects. It will be really interesting to see her making a comeback post her delivery. Other Bollywood actresses that we would like to see back on screen are Meenakshi Sheshadri, Manisha Koirala (seen in brief appearance in I Am), Ayesha Jhulka and Tabu.